This show is so awesome!!! I wonder if the Satan is really supposed to be like this?!! The show gets you hooked into watching it, truly a wonderful show!! Glad Crunchyroll acquired it!! Just wondering, are Crunchyroll's taste in anime ongoing or completed anime? I've watched this show so many times and I really want to see a second season!!! The Devil is a Part-Timer has so many interesting characters that really hook you into the show. I just want to sit down with a cold drink and watch this over and over!!! Please make a second season crunchy roll! After watching the first 15 minutes or so I was going to pass thinking that it was one of those uber powered character fantasy shows. However, I persevered because the show description just didn't seem to fit my initial impression. I was right. The show is full of tongue-in-cheek type humor and doesn't take itself seriously. There is some action but not much. Most of it is just character interaction. So those looking for 100% action based on the first 15 or so minutes might be disappointed. If you're looking for something casual and doesn't take itself too seriously this is a good show. It's a pretty clean show with a little fan service but nothing that should turn people off. I had been hearing about The Devil Is A Part Timer for some time. People had been recommending this show left and right. So the moment this show was added to Crunchyroll, I queued the show up and let it sit there. Eventually, I found the time and binged the entire show. I am satisfied to say that the show is as good as people told me about. This show is extremely well rounded and has next to no weaknesses. First, the OP and ED are good. They work in harmony with the show and match it perfectly. Second, the characters are amazing. I love the way they act and their attitudes towards each other. Third, the story is well written and a blast. The premise helps, but the general day to day actions of the cast are amusing and fun to watch. The show never takes itself too seriously. Fourth, the show is funny. There were moments where I was laughing like a madman and I couldn't stop.Fifth, the animation is well done. The few battle scenes in the show are well animated and heart-pounding. The way the characters move is realistic and believable. Finally, the voice actors did a great job. The voices are believable and fit the characters perfectly. I only have two minor complaints about this show. The first one is that it seems like it could be better. While the show is amazing as is, I have this feeling that there is something that could be added to make the show even better. This seems like a minor problem, but I can't ignore it. Another complaint is on rare occasions, the jokes fall flat. This could be just me, but it never feels good to have jokes fall flat. It just feels awkward. 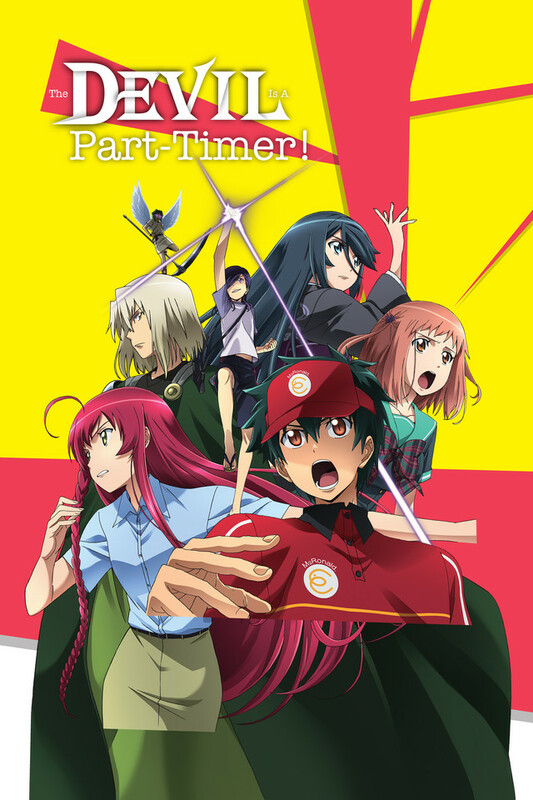 Overall, The Devil Is A Part Timer is a good watch that hits many of the right points. It is a great adaptation that deserves a second season (please White Fox). I recommend this show to anyone that is interested. Don't be scared off by the wacky premise. It is an amazing watch. Probably one of the most entertaining anime i've ever seen my review will be quick and simple but if you're sitting on the fence about watching this one give it a chance extremely funny and the fight scenes are incredibly awesome. Has a bit of a slight harem but it was enjoyable. the first arc (first 5 episodes) is as good as it gets. The humor, the animation the story, the romance, the politics, definitely one of the best ever. I like the shows ability to take a battle between the hero and devil and turn it into a lecture about how to handle a romantic break up, much to the dismay of the hero. The remaining episodes are good, but do not match the expectation established by the first arc, but still much better than 90% of the shows out there. Overall, this is one of my favorite shows and I would strongly recommend watching it to anyone. I've re-watched this show many times, and still love it. It is a comedy first and foremost, [technically a]slice of life second, and a shonen third. You won't be emotionally invested in the story, but you will be thoroughly entertained. Animation is solid, soundtrack is good, but the comedy is amazing. I wish the devil was my co-worker! This show was great. I love all the characters and their designs. The twistedness each one of them had was great too! I only wish that when I worked part-time work (Even now as a full time worker) that my co-workers worked as hard as Maou! I hope that someday a spin off or a second season comes, but that is just because of my love of the characters. this was the second anime i saw and this is the one that made me love anime. I recently got the dvd and saw the anime about 4 times it is so good. i wish more peopol knew about it. since i need friends who saw this. and i love the charcters so much i NEED a s2 now pls im srs i need it i neeeeeeeed it. Amazing story about a part-time devil! I'm glad to see Crunchyroll has picked up this show since they took it off Netflix. The story of a demon lord who has to work at a chain burger joint is absolutely as hilarious and goofy as it sounds. There's also a well-written subplot that the main character was only an antagonist because he was only trying to do what's best for his people, but that doesn't come out well in the show. Overall, it's 4/5 because it's a good show, but doesn't showcase the true depth of the original work.